I learned a lot as a child by soaking up the wisdom of my elders. My father often brought me along when he called on friends and I sat with him when he entertained visitors in our home. While I was visiting my family in July, we received a visit from a worldly and well-read family friend. In addition to being an excellent medical doctor, he’s a voracious reader of poetry and literature. When I recall career or academic mistakes, many had their roots in frustration or emotions coupled with lazy logic. When I think of times I really connected with someone, I succeeded because I took the time to view their whole, human self and empathize with their feelings. Second, a passage from the novel Cutting for Stone by Abraham Verghese. Chief Resident Dr. Stone is reviewing the previous week’s surgeries in a meeting with his staff. 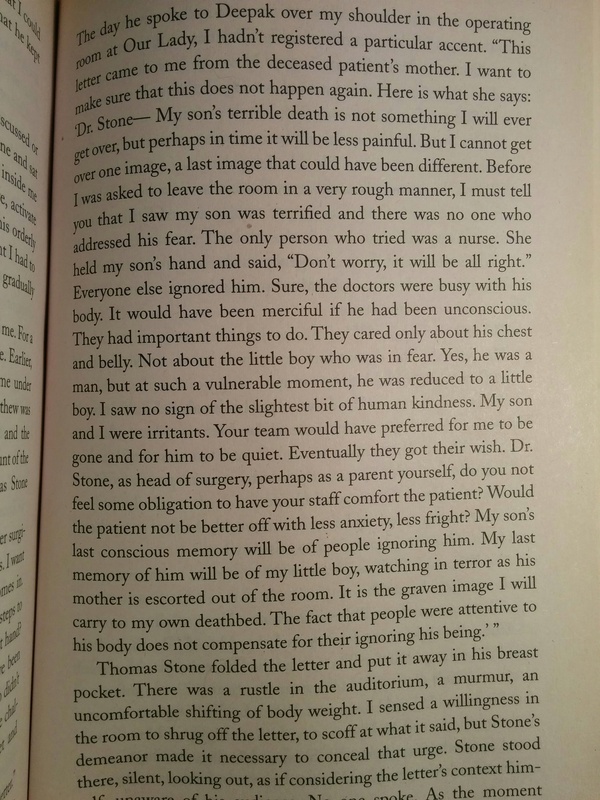 A woman wrote to him after her son died in surgery.